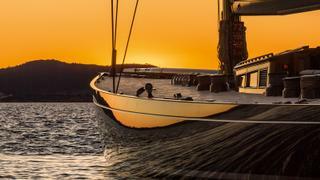 Silhouetted against the Mediterranean sunset, Svea’s overhangs are awesome to the point of outrageousness. 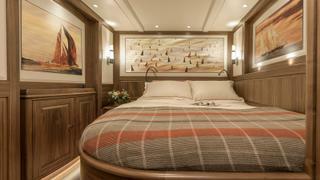 Her original profile was based on an analysis of the development of the J Class after the 1936 match racing series. The Swedish naval architect and boatbuilder Tore Holm, famous for his Six Metre and Eight Metre class racing yachts, had turned his pencil to the far bigger Js and he set out to design to the longest LOA the class would allow. He had completed his yacht’s lines and sailplan in 1937 just before the Second World War changed the world’s priorities and, with it, sailing and the great and glorious international regattas, including the America’s Cup. Europe would take decades to recover economically and when it did the J Class seemed a little anachronistic. 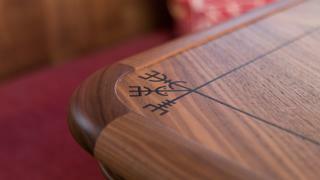 Holm himself was a proud Olympic sailor from a boatbuilding family in Gamleby, Sweden. So it would not be a stretch to imagine him designing a yacht for Sweden’s elite to take on Europe’s best. 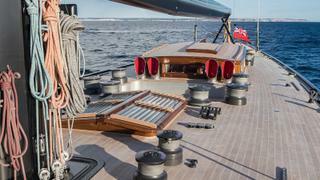 Even though he continued designing boats into the 1950s, mostly Skerry cruisers and international classes, his J Class plans remained in a drawer. J-S1 probably would have remained a ghost except for a trio of coincidences. The first was when the secretary of the International Eight Metre class, John Lammerts van Bueren, received permission from Holm’s heirs to comb through his drawings for plans of un-built Metre classes. In the attic of the family home, he came across the unmistakable plans of a J Class signed by Holm in 1937. The second coincidence was that Lammerts van Bueren was good friends with Dutch naval architect Andre Hoek. Hoek was fascinated by the discovery and assembled a group, including a potential owner, to buy the rights to the design. “We could see that there was a growing interest in the J Class,” says Hoek. His firm Hoek Design Naval Architects had earlier been hired to analyse the 1936 designs Sparkman & Stephens and Starling Burgess made for the replacement of Harold Vanderbilt’s 1930 Cup winner Enterprise, an exercise that led to the building of the original Ranger. Hoek’s task in 2005 was to find a design that could be updated to the modern class rules. This became Lionheart, which was launched in 2010. His team set about modernising the design to the new class rules. Construction started and with the two halves of the hull and deck completed, the owner pulled out, leaving the builder, Claasen Shipyards, with the unfinished hull and Hoek in search of another potential owner. 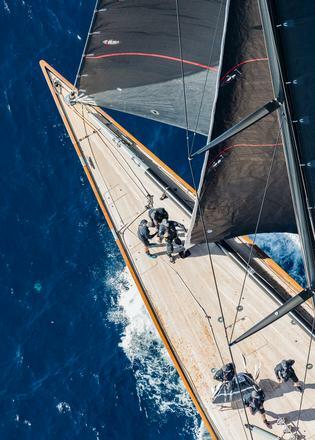 Enter coincidence number three — an avid racer who wanted to be able to sail in the America’s Cup Superyacht Regatta and J Class Regatta in Bermuda last year. The owner’s fleet manager picks up the tale. 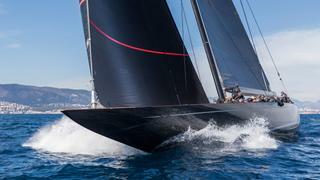 “He saw five Js racing at the Superyacht Cup and that was pretty impressive and twice we were involved in regattas where Js were competing. He sailed Endeavour and had chartered Rainbow for the Cowes Centennial, but then that boat sold,” he explains, adding that his boss also had the opportunity to sail Lionheart and Hanuman. 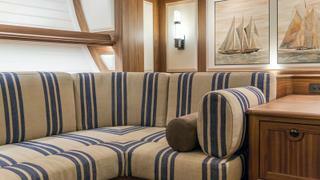 When he learned of the opportunity to buy the hull and deck of the Swedish design from Claasen, the owner took it, realising that that was the only way he would be able to make the event in Bermuda on his own boat. And so began the programme to finish a J Class from a bare hull in just 14 months. The build was completed at Vitters, which had arranged a partnership with Claasen. Tako van Ineveld, formerly a director at Holland Jachtbouw, had been involved with the build and sailing of Rainbow. Now heading his own independent project management company, he was the perfect choice to direct the build of Svea as the owner’s representative. First on the list of modifications for the new owner was the addition of a doghouse and a revision of the deck layout. Originally the wheel was mounted on deck like Endeavour’s and there was no cockpit, notes Hoek. “But it is such a big wheel that it’s hard to put a lot of pressure on it unless you are on the centreline, but at times you really need to see what’s happening on the lee side. We felt it would be better to create a shallow cockpit and recess the bottom of the wheel in a well to give the helmsman a better position.” Unlike many of the details of the J Class, the layout and dimensions of the cockpit and the position of the wheel and winches are not part of the regulations. Svea’s cockpit is one of the standout features. Hoek and the owner’s team revised the plan, essentially splitting the sailing functions into two cockpits. 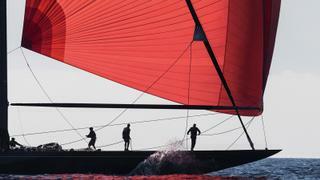 The afterguard — helmsman, tactician, main and jib sheet trimmers and the team on the running backstays — are in constant visual communication and within easy hearing distance of each other while the halyard and spinnaker trimming winches and their crew are forward of the doghouse. 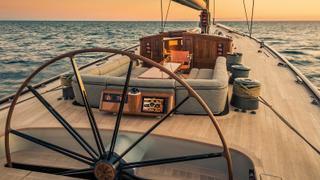 It’s an inspired set-up for fast, quiet communication, says Vittorio Papa of the Hoek Design office, noting there are no winches behind the helmsman. When in cruising mode, a U-shaped framework clips in around the edge of the cockpit to provide comfortable seating for 10 around a gleaming teak table. 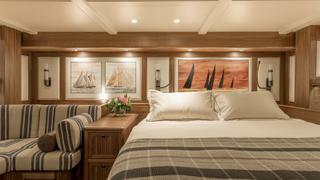 The owner wanted an interior with an owner’s suite plus two en suite guest cabins, a comfortable combination saloon and appropriate quarters for six permanent crewmembers. He chose Pieter Beeldsnijder to draw an interior that would nod to the classics, but not become a costume drama. For example, the joinery is open grain matt-varnished walnut and the simplified raised panels are off-white. Hardware is a tasteful gunmetal that complements the carbon fibre spars and sails and the deep grey pearl of the topsides. 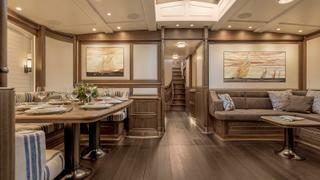 One of the more modern interior features of Svea is a drop-down wall panel between the galley and saloon that creates an informal breakfast bar. 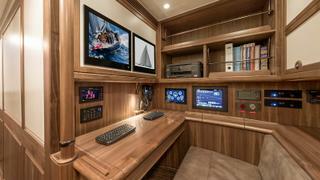 While the cabinetry looks rich, 80 per cent of the interior is veneered foam core to save weight. The added teak doghouse is carbon fibre with teak veneer. Sadly, in the middle of the project Beeldsnijder passed away. While Hoek Design transferred his hand-drawn sketches to AutoCAD details, Michiel de Vos of deVosdeVries Design was brought in to complete details for interior manufacturer List and choose soft goods with the owner. In the small town way in which everything in maritime Holland seems just a few degrees of separation apart, de Vos formerly worked with Beeldsnijder before starting his own firm and earlier sailed as second engineer on the J Class yacht Shamrock V.
First and foremost, Svea is a racing yacht and the owner is committed to providing everything to work towards victory, says Captain Paul Kelly, a veteran of the classic schooners Borkumriff IV, Atlantic and Eleanora. Part of that commitment was assembling his 2017 race crew to sail on the boat in sea trials in Holland and then to assemble for full-on practice throughout April in Palma. “We have the benefit of 20 years of development on Ranger and five or six on Lionheart,” notes Kelly. “I think we are in a better position right out of the packet. Of course, they have the years of practice but our 28 crew have really settled into their roles.” All of the permanent crew also race. “Svea is an absolutely incredible fusion of 1937 design and 2017 technology,” says Kelly. “We look like 1937 but strip away the veneer and we are as modern as they come.” Contrasting the J with his previous charges he is quick to note “this one is a lot easier to drive”. Moder Svea, which translates from Old Norse as “Mother Sweden”, has been the patriotic symbol of the country since the mid-1600s. 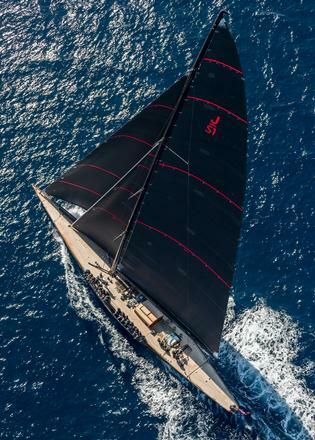 Usually depicted as a powerful female warrior, Svea seems the perfect name for the yacht that carried her country’s seafaring heritage onto the world stage when the Js did battle during an America’s Cup for the first time since 1937. First published in the June 2017 edition of Boat International.